Could you please tell us what is exactly what you want to know? and in that way we can assist you better. 1. Go to the Power Tools option in the left side menu. 2. Then drag and drop Image option wherever you wish. 3. 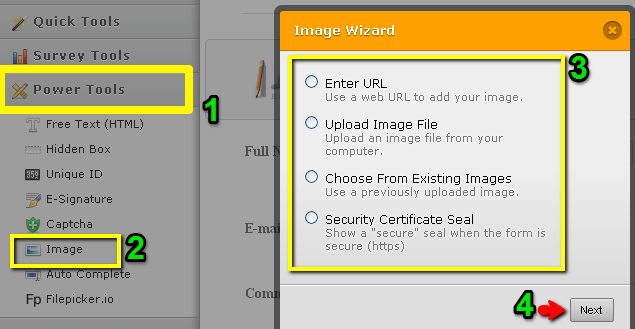 After that in the Image Wizard choose a method to add your picture. 4. And click on Next. 5. Then you have to follow the system instructions. After that your picture will be inserted on your form an you will be able to manage it. Thanks.. My question was actually a seach topic. I didnt see that this was a forum. Great Service! !